Wire shelves – they’re a common sight in many different warehouses and storage facilities and serve as the backbone of many operations, but do you know how to properly install and maintain them? 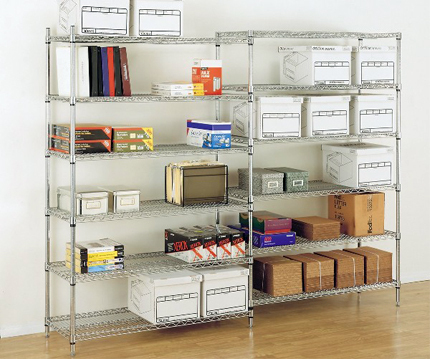 There’s more that can go into the usage of wire shelving than just assembling and keeping products on them, and understanding the safest ways to use these shelves will help maximize your storage capacity and keep your workers (and products) safe from accidents and injury. Always have extra parts on hand. No matter how durable your chosen storage solution can be, it’s never a bad call to get some extra parts and accessories in case of breakage or accident. Keep some wire shelving parts in an easy to access area and make sure your staff is trained on their usage and installation in case repairs need to be done or shelves need to be expanded beyond their current limits. One of the most common causes of accidents and breakage involving wire shelving is improper distribution of weight and products. No matter how light you think your inventory might be, there’s always the risk of front- or back-loading your shelves, causing them to fall over and risk injuring an employee. Check all manufacturer’s guidelines for weight limits and make sure all products are spread evenly across the shelf to prevent damage. Make sure it sits level. A surprising number of warehouse accidents and injuries can be traced back to unlevel floors and uneven shelving. Make sure each post is set evenly and to an appropriate height for the area it’s in, even if it has to accommodate for the occasionally uneven floors we’ve all seen in a warehouse or two. Mount all shelves as securely as possible. Whether you’re mounting your full-sized rack into a wall or you’re installing wall mounted wire shelves, proper mounting is crucial to make sure the shelves don’t fall over and hurt anyone and/or damage products. Before installing the mounting brackets, check the area carefully with a stud finder to make sure the drilling is performed as safely as possible and that the brackets are all installed securely enough to handle the weight of whatever is stored there.